Chris Yeh brings a writer’s mindset to everything he does. He was one of the first influential bloggers an activity that eventually led to countless other opportunities—including his recent incarnation as co-author the New York Times bestseller The Alliance with good friends Reid Hoffman (founder of LinkedIn) and Ben Casnocha. He was also an early investor on many of Silicon Valley’s biggest success stories. Today he tells us how he moved from a creative writing student at Stanford to a startup maven. 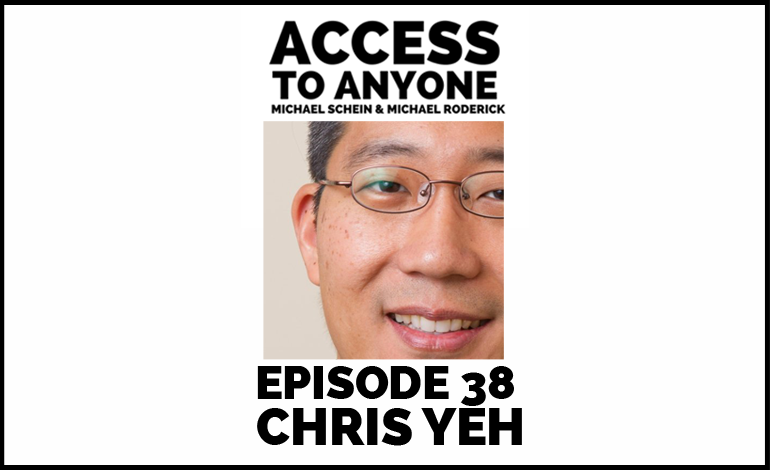 Chris Yeh has been building Internet businesses since He is a General Partner at Wasabi Ventures, a global venture fund, startup incubator, and consulting firm, where he leads the firm’s investment committee. Previously, he was the first investor in and interim CEO of Ustream.TV, which provides an open and distributable platform for live interactive online video. He also helped start numerous other companies, including Symphoniq Corporation, TargetFirst, and Juno Online Services and FarSight Financial Services (divisions of D. E. Shaw & Co., L.P.). Chris is an active angel investor and advisor to a wide array of startups. He is also the founder and Chairman of the Harvard Business School Technology Alumni Association. He’s earned two degrees from Stanford University and an MBA from Harvard Business School, where he was named a Baker Scholar.